All very good information. Thanks for posting! For some of the cutters I got on eBay, I’ve tried using the speed/feed calculator at http://www.custompartnet.com/calculator/milling-speed-and-feed but am gradually finding that I need to determine the speeds for cutter/material combinations more or less by trial and error. Thanks again @UnionNine ! This is very helpful. As we find good settings for various materials with various cutters, we should probably start creating a database of what works well, since the loading is specific to what the force is that the Nomad drives the spindle around with—I’m sure it’s not too far from that of the Shapeoko or other machines with similarly sized motors, but it’d be nice to have confirmed setups to reference as a baseline. Am collecting little bits of data and advice that I often want to refer to, except I’ve forgotten what post in what discussion had it. Corrections, additions and improvements are welcome. What I meant was (and perhaps you’ve already answered this, haven’t read the whole thing yet), that given the same machine, the same Carbide 3D bits and the same Carbide-sourced materials, do we have a database of what feeds and speeds and spindle speeds (or at least what ranges) have worked well for people? Unfortunately, we don’t have much Nomad-specific information as-of-yet. Probably a lot will come out when Carbide Create is publicly released. I really wish that Carbide 3D would just license G-Wizard and put it inside MeshCAM and Carbide Create. Choosing end mills requires choosing the appropriate characteristics (e.g. diameter, number of flutes, shape (flat, ball, bull nose ends), flute direction (up, down, compression cut) and so forth. Please jump to the putting it all together section if you want a simple summary. What follows are details of how and why to choose certain attributes of end mills. It takes some effort to learn the lingo but it is worth it so one can order end mills directly from a machining supplies vendor or distributor. They are used talking to experienced people but many of them are happy to talk to experienced amateur/hobbyist users. When an end mill cuts into stock, there is friction… the rotation is impeded. This necessitates torque in the spindle to ensure we can cut through the material at the specified RPM. More flutes, more cutting surfaces and more demand for torque. Since the spindle only has a finite amount of torque, there is a limit to how many flutes we can use with a given spindle, a given feed/speed, a given cut depth, and given type of material. More flutes means more cuts per rotation so we can cut material faster right? Not necessarily. We’ve got have sufficient torque to keep the spindle running at the specified RPM against the increased friction due to the increate flute count. The Nomad is a bit limited in its spindle torque. With the exception of soft materials like Renshape and MDF, 4 flutes (or more) are likely to not be worth it - or even work - in most applications. This is definitely an area open for experiment - can 4 fluted end mills improve machining speed and, if so, what are the limitations (materials, feed/speed, finish)? That said, we can go faster than 2 flutes - 3 flutes! Up until relative recently it was hard to make end mills with an odd number of flutes - the lack of symmetry made manufacturing difficult and measuring wear was more complex. Now-a-days one can get 3 flute end mills that are not expensive. Well worth investigating. Some materials, when one has a low torque spindle, are best machined with specialty end mills. One flute! The physics of cutting is complex so we will not discuss here why 1 flute works better than 2 or more flutes. Aluminum alloy (e.g. 6061), polycarbonate, and acrylic all benefit greatly from machining with a single flute on a small torque machine. Notice that I’m not saying one cannot machine these materials with 2 or more flutes. It can be done and be done well… it’s much harder to do it well that way. Aluminum machining and want a single flute? I recommend the Onsrud 63-604 for the Nomad. Up cut, down cut, compression, variable radius helix, chip breaker, hogger… the list goes on. The most common end mill is up cut. It pushes the swarf - the stuff cut away - up and away from the work. This provides natural waste removal, cooling and other benefits. The downside is when one uses an end mill to drill into a finished surface. The “up” pushes the surface up, potentially tearing it (e.g. an up cut end mill with plywood wants to rip up the top layer of the plywood). The down cut end mill does the opposite. It pushes the swarf down. This is great for the surface but not so nice for getting the swarf out of the way. A down cut makes sense is you’re going through the stock - essentially drilling holes. Compression end mills… are you ready for this? These combine both up and down cut flutes! The flutes go one way for the top half of the end and the other way for the lower half. These are wonderful for things like plywood, polycarbonate and acrylic - it doesn’t rip up the top layer and tends to push the stock onto the bed, increasing the holding force, ensuring that the stock doesn’t move. Variable angle end mills vary to helix (the “spiral”) angle as they go from top to bottom. These have nice properties particularly for metals. The constantly varying angle prevents resonances, vibrations, and problems with clearing the material that has been cut. For aluminum alloy (and metals in general), high fixed helix angle (45 degrees) works much better than low angle (30 degrees). A variable helix - where the helix angle changes constantly - is a more expensive but very effective way to machine aluminum alloy faster… it helps avoid resonance issues, improving flute contact with the stock. Square end end mills cut… square to the end mill - flat. Ball end end mills allow one to cut curves and variable height surfaces. Since a 3 axis machine cannot move the stock around automatically (that’s 4 and 5 axis stuff), a curved surface becomes an approximation. The ball end end mill allows one to do that approximation well… up to a point. Bull nose (a.k.a. corner radius) end mills are a hybrid of the ball end and square end. The center of the end is square but the edges “turn up”. These are really useful! If you’re cutting signs with raised letters - milling away the stock from the letters - the letters meet the stock underneath at 90 degrees. That tight corner has a tendency to easily break or crack. If the letter was finished properly with a bull nose end mill, the letter would join the stock underneath with a nice curve - without the scalloping one would see with a ball end end mill. The cutting edges of an end mill are designed to cut through steel and titanium. They are SHARP. Never handle an end mill by touching the flutes. Ouchies will result. When storing end mills it is important that they do not touch each other… we do not want to dent or dull the flutes. Quality end mills come in little plastic or cardboard tubes. This is an excellent place to store them when they are not in use. Some people put a TINY drop of oil in the tube once in a while. Others machine a storage board that store the end mill separately. All of the end mills need to be stored in a cool, dry place. A small tool box, just for your machine tools, is a good idea. Over time, one tends to land up with many end mills and specialty tools so having an easy way to take the out and put them away is a good idea. What is an end mill made out of? The old standby is High Speed Steel (HSS). This is very tough steel (Iron alloy) that is certainly capable of machining everything that the Nomad is capable of. HSS has been around, in one form or another, for nearly two centuries (yes, we’ve had mills that long). Our modern steels make end mills today last much longer than yesteryear. None-the-less, HSS tends to lose its edge somewhat quickly… but they are also rather inexpensive. The formula for HSS varies a bit - depending on the vendor - but true HSS from any trustworthy vendor is fine. Heat Iron ore until it has the viscosity of water (3000 degrees F), blow air through it, then mix in Molybdenum, Vanadium, Chromium and other fun things (often a secret sauce). Today, it’s uncommon to use HSS end mills due to improvements that I will be mentioning below. That said, they are great for learning and early machining efforts. Did I mention that they are rather inexpensive? Next on the list are carbide end mills. This is a rather inexact term; without careful understanding and research, one can land up buying crap. The most basic form of carbide is actually a coating. Basically, take a HSS end mill, heat it to the “just right” temperature and immerse it into a “bath” of carbide materials. The carbide diffuses into the HSS and toughens the skin… the end mill lasts longer and, being stronger, can feed/speed faster and lasts longer. Sadly, the beauty is only skin deep… the tough layer wears off quickly and most of the end mill is still HSS. When one buys carbide drills at Home Depot, notice that they don’t last too long? That is because they are often this dipped type of carbide. The next level of carbide is solid carbide. Mix the carbide in with the liquid HSS and let them mingle for a while. Now make an end mill. The end mill is tougher - throughout - and so can be pushed/spun faster and lasts longer. There is a downside though… carbide tends to form grains that are fairly large. If the HSS mixed with carbide is not made “just right” the grains are “lumpy” and the edges of the flutes do not wear evenly. Which leads us to “solid carbide, micro grain”. This is the toughest steel with the finest carbide grains one can usually find - more than enough for just about any machining effort. As the steel toughens up - HSS, carbide, solid carbide, micro grain carbide - the end mills will tend to deflect less under pressure (feed). This improves the quality of the finish and feed/speed can be increased. Coatings cause no end of confusion, largely because there are so many of them, they have confusing sounding chemical names, each coating has different characteristics, and some coatings are not recommend for working in some materials. Coatings are specialized materials that are tougher than “solid carbide, micro grain” steel and provide additional advantages for machining. A tougher coating means that the end mill will keep its edge longer - the life of the end mill is increased. Unless one is severely pressed for budget, it is almost always the right thing to do to get the more expensive, coated end mill. Yes, it may cost 20-50% more but a coated end mill will last 3-5X longer than HSS (and many “carbide” end mills). 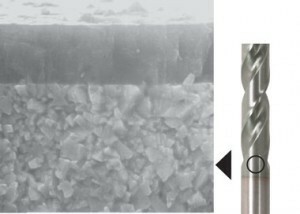 Most coatings also have a finer grain size and nicer molecular properties than the “solid carbide, micro grain” material they coat - they are “slipperier” than uncoated end mills. This means the cutting may be done with less friction - we can use higher feeds/speeds and get a job done faster. Here is an electron microscope picture of the cross section of a coated end mill. Notice how smooth the coating is compared the metal below; it’s tougher than the underlying metal too! This is “ok” stuff. Any coating is better than nothing but unless forced to use this coating, use something else. It has a distinct yellowish/gold cast. This is good stuff, even better than TiN. It has a bluish/violet-grey cast. This is the best general purpose, commonly available coating. It should not be used for aluminum alloys. It has a purple cast. This is a coating to use for aluminum alloy work. It tends to be a bit pricy but it is well worth it. It has a silver/grey cast. This is a coating to use for aluminum alloy and titanium work. It has a yellowish/gold cast. This is a coating to use for aluminum alloy and titanium work. It has a blue/grey cast. It’s on the pricy side but is well worth. It’s the “new guy on the block” at the time of writing. These are expensive coatings but are incredibly tough and due to their very low coefficient of friction (“slipperiness”) can provide feeds and speeds MUCH higher than virtually all other coatings. The downside is price. These can add 50% or more the price of an end mill. Single flute end mills tend to be offered without coatings… the nature of the beast is such that a good “solid carbide, micro grain” end mill is almost definitely sufficient for the job. I will use VDD/DLC coatings with very small diameter end mills (e.g. 3/64") when machining Al alloy. This allows for very fast feeds and speeds when fine detail and finish work is necessary. NOTE: It is VERY IMPORTANT to not use a coating that includes aluminum when machining aluminum or aluminum alloy (e.g 6061). The heat of machining can cause chemical reactions with the coating. VERY UGLY! Quality - and I mean THE RIGHT STUFF - end mills can be refurbished/resharpened. Typically this can be done at least once or twice at ~50% the cost of a new end mill. Get quality end mills and refurbish them a few times before they “expire” and go into the recycle bin (don’t throw them out). Drills have the same advantages and failings as end mills. The same steel and coating choices hold true. For those new to drills, imperial drills were standardized a long time ago. If you haven’t been confused by a drill specification in a CAD drawing or WEB order page yet, you may be without the magic decoder ring. You have or will see things like a Q or a # 49. A very long time ago, drill sizes were standardized. Small diameters are numbered, larger ones are lettered. You can find complete tables online and local machine tool shops either give away or sell laminated cards that condense the information into a handy form. My machine tool box has such a card in the top. Many WEB sites and catalogs are careful to list both the standard designator (letter or number) and the diameter. You might think that after the above discussion that my drills are exotically coated and made of solid carbide, micro grain. Nope - HSS. I don’t drill that that often so HSS is fine for me. In a large machine shop where every minute counts, the drills would be fancy - and used constantly. I use drills when I need a very special hole size and/or I can’t do it with an end mill on hand. Most of the time, if I use a drill, it is because I’m going tap a hole - use a special tool to cut threads in the hole for a screw or bolt. No, all vendors are not created equal. In fact, many of them cheat, or report something that is minimally true (e.g. yes, it’s “solid carbide, micro grain” but the steel wasn’t annealed as well as it could have been done, the carbide grains are formally “solid carbide, micro grain” but not as small as they could be, the coating is not as thick as it could be, the formulation of the coating is correct but not with the best ratio). One must go to a known, trusted source for their end mills. Vendors - good, trustworthy ones - have their own formulation for a coated, “solid carbide, micro grain” end mill. Things vary a bit from vendor to vendor. Searching the internet for references will be confusing - one group says they are fine, another OK, and yet another horrible, do not use at all costs. Different shops have differing milling patterns and yes, some vendors are better for them than others. The Nomad does not have the horse power to get into the performance region where with this can become a factor. Each shop uses what works for them and rarely change - they can’t afford the time to evaluate another vendor (they have a job to get done). Only if a vendor can talk them into it with claims of SO MUCH BETTER will they try - and winning them over for a change is rare. This shows up on the internet as Fanboi like remarks. It’s perfectly OK to deal with any distributor as long as they are trustworthy - no counterfeiting. Finding a trusted vendor is often done by reference - your teacher, master, etc. - says to order these. Needless to say Carbide3D is a trusted vendor. Kodiak Cutting Tools and Harvey Tool are my “go to” vendors. Garr and Niagara are my secondaries. LMT Onsrud for specialty end mills. Yes, that LMT Onsrud end mill sounds expensive but believe you me it will well worth it. They make single flute end mills for polycarbonates, plastic, and Al alloy that are world class. Works of art. PROMAX for crazy needs. Where is that 7 flute end mill for Titanium? C.M.T. Utensili for “V” bits. Collets from MariTool or Precision Bits. My distributor of choice is Coast Tool. One should always strive to use the shortest Over All Length (OAL) in an end mill. The longer an end mill is the easier is for it to deflect (“wobble”), causing increased tool wear, chatter, poor finish, and excess heat. Be particularly careful with end mills 0.125"/3 mm in diameter and smaller. It is all too easy to introduce a significant amount of deflection into your machining. Seriously consider using a feeds and speeds calculator program (e.g. G-Wizard) that deals with deflection. Deflection doesn’t have to be zero but it needs to be MUCH less than the finish (e.g. the Nomad can achieve 0.001"). There is a type of short end mill called a “stub” end mill. Consider using one of these whenever possible. End mill flutes have a length as well. Whenever possible, one should choose an end mill that has a flute length equal to or longer than the maximum stock cutting depth. Put as much cutting surface as possible into the effort! GET THE RIGHT TOOL FOR THE JOB! HSS is fine if you’re first learning, have a very tight budget, or don’t do much machining. Solid carbide is better… at bit more expensive than HSS. Solid carbide, micro grain is the best steel… a bit more expensive than solid carbide. Solid carbide, micro grain, AlTiN coating - best for general work. Solid carbide, micro grain, ZrN, TiB2 or VDD/DLC coating - best for aluminum alloy work. High helix angle for metal work, variable if you can go for it. Can’t swing the cost for a fancy coating? Choose one of the others. Any coating is better than none! No coating and good steel is better than bad steel. A “solid carbide, micro grain” coated end mill will be more expensive than HSS. That said, the cost difference is more than offset by the usage time (3-5X) and the nice increase in machining speed. It is a good idea to order tools in pairs or quads. This way your have spares on hand if the tool breaks (easy with small diameter tools) or becomes dull; work can proceed while a replacement order is outstanding. Can End Mills Be Resharpened? What machine tools should one buy? Nomad and/or CM not remembering zero? SO3: Are things on track for the XL and XXL shipments to begin? Specialty endmills, where do you buy? This is incredible, thanks @mbellon! One small addendum - be careful cutting aluminum with AlTiN coating – according to the tech guy I spoke with at Harvey Tools, that coating will actually bond with aluminum while cutting it, resulting in unsatisfactory results, to put it mildly. I don’t know if this applies to ALL such coated bits, or just Harvey Tool, but if you plan to cut Al, it’s probably worth checking before you click purchase on some pricey new bits. Correct, AlTiN is not suitable for aluminum alloy (e.g. 6061) - a general restriction. It is useful for almost all other materials. I will update the text to indicate that. This made me want to try a 1/8" 1-flute TiB2-coated end mill to cut aluminum, but I couldn’t easily find one online. Does anybody have a recommendation? Harvey Tool has TiB2 coated end mills. For those who got the notification of the creation of the posting I did on end mills, please go back and look at the current version. I added sections for drills and end mill handling and storage. I added a section that identifies the vendors that I use. I also did some clarification to the text. Any feedback will be graciously accepted; I will keep the posting updated. While there are many, many vendors that will an array of offerings, anything mentioned in the post will be available from one of the vendors I use (and have listed). Single flute Al end mills tend to be “solid carbide, micro carbide” (uncoated) tools. Niagara is well known for theirs… but there are many others. I digging for TiB2 single flute now. Thanks @mbellon, I took a look at their offerings, but I couldn’t find any 1-flute cutters, those seem to be hard to find, especially in combination with this coating. …I couldn’t find any 1-flute cutters, those seem to be hard to find, especially in combination with this coating. Correct. The machining characteristics of single flute end mills are such that coatings are not common. I would check out a Niagara. If the catalog is too much or you need help wading through all of the offerings, feel free to message me and I can help. On our Haas, we’ve been trying some Destiny Tools Viper endmills and they’ve been really good. They’re really expensive but they’ve got a great reputation and they’ve performed really well so far. I haven’t bought any .125" to try on the Nomad yet but I thought I’d mention them here. They also have two-flute versions but we usually use 3 for aluminum. We can also get our tools with a ZrN (Zirconium Nitride) coating. Let me know if you’re interested and I’ll get some pricing. Regarding @mbellon recommending Onsrud, we agree for exotic plastic bits. Looking at a brand new one is like looking at a piece of art. I’ve also used Harvey, Niagra, and Fullerton with good results for more generic cutters. Other than the Destiny tools we’ve been testing, we use the same tools we sell almost exclusively in our Haas to make the Nomad. The only difference is the diameter and the ZrN coating. The machining characteristics of single flute end mills are such that coatings are not common. Got it, that’s good to know. I found plenty of regular 1-flute offerings, so I’ll look at those. Thanks again! I was editing as you were posting and… I was adding ZrN as an alternative to TiB2. Both are great for aluminum (and titanium) work. THANK YOU!!! This is just what I was looking for. Thank you Mark Bellon! Very helpful and informative.